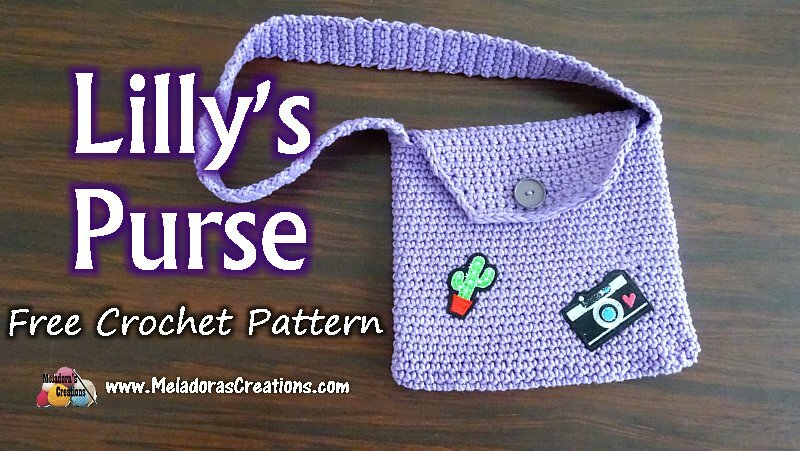 This is a one skein crochet pattern designed by my daughter Lilly. Hope you can make it for someone you love. I went to the yarn store to get some supplies this summer and my daughter came with me. When we were there the lady told me about this new yarn they had called jeans yarn. Find the info about here HERE I got #72 color lot If you can’t get this kind of yarn, then I recommend cotton 4 ply worsted weight yarn \ Aran 10 ply You will only need one skein! It does feel like jeans when you make something from it! It’s tough like jeans but soft like jeans too. So it’s perfect for bags! My daughter instantly started sharing her love to have a bag made from it. So I told her if she wants to design a bag, then we can come back and she can pick out the colors and stuff for it. She set to work! This is what she came up with and this is what we made. 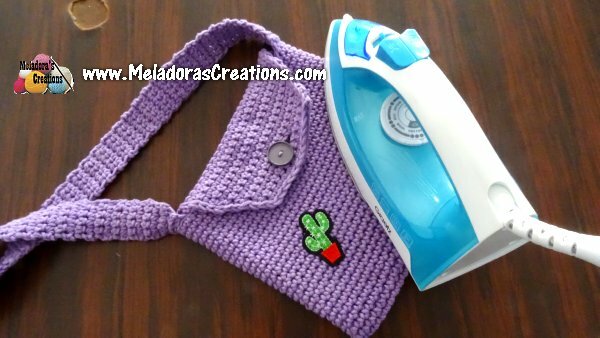 She saw some iron on patches and I thought to myself “patches go great with jeans!” so I let her grab her favorites ones to make this purse more special to her. 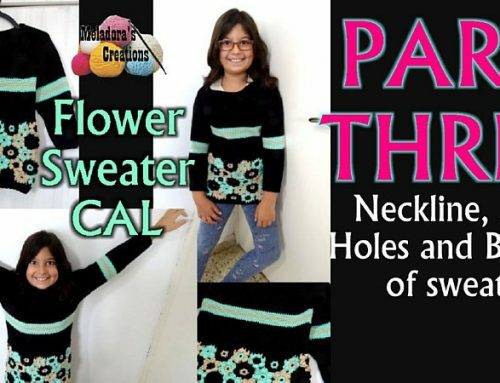 So patches are optional, but you will need a button and a tapestry needle and at least 1 stitch marker. Do 28 SCFS’s. 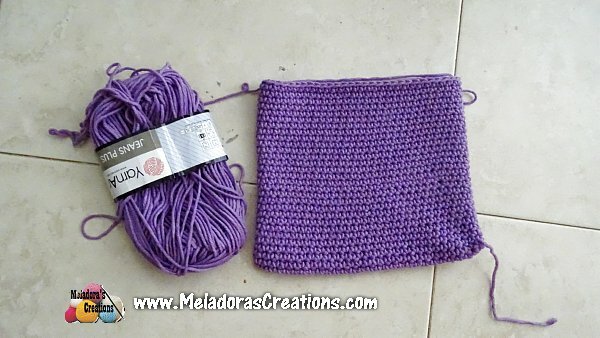 Sc 2 in the last stitch you created, (should be 3 sts total in st) this will create your corner, pivot your work and start single crocheting down the bottom stitches. SC 3 in last st on this side too. You should have 58 ch’s around. sc in first st and place a marker to mark your beginning stitch. We’ll be working in one continuous round now. sc in all sts. Make sure your stitches are tight, think of it like your making a Amigurumi doll and try to keep your stitches tight. If not then as you make rows 2 & 3 it will start to get wider, and you want to prevent it from getting to wide. At the end of row 29 you should have a double sided piece that measures 18 cms or 7 inches. Also want to lay your piece flat and stop on the very last stitch on the end. Mark the beginning stitch on this side as well. 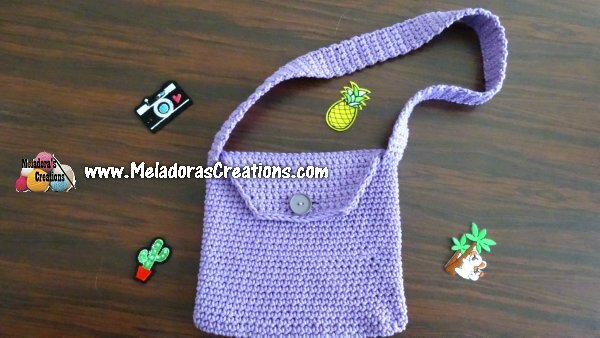 Grab up your loop again and start crocheting in rows. sc in all 14 sts. Cut your yarn. 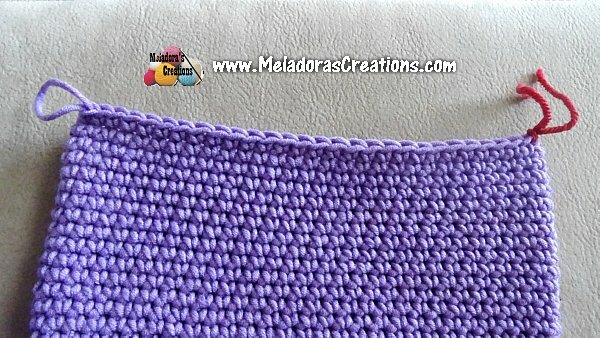 I re attached my yarn on the side of the flap and did a very loose row of slip stitches to create the border. Attach your yarn in the same stitch as your flap. Single crochet 5 sts over. CH 1 and turn, sc in all 5 sts. Do this for 90 rows total. Then when you’re ready to attach, line it up with the row on the other side. Mark it as well if you need too. Your strap should be the piece on the inside with the row of the purse on the outside as shown in the picture below. To get an idea where to sew your button, just hold the flap down and insert your hook. 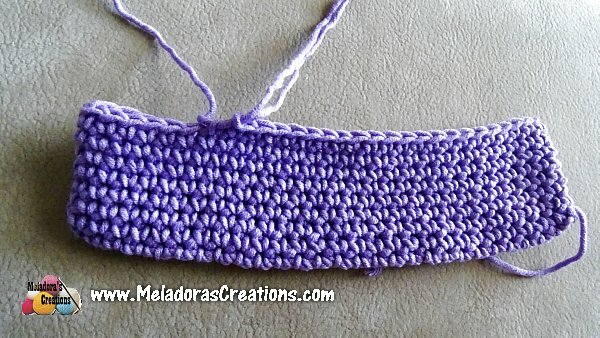 Hold the place here by using a stitch marker. Leave a tail when you thread your tapestry needle. Come from inside the purse out, then back in again through another hole of your button. Make sure you end your sewing on the inside of your bag and leave a tail here too. Tie a few knots and hide your tails. Iron on your patches or sew on your motifs and your purse is done! Next Sunday you can check out Ambassador Crochet! 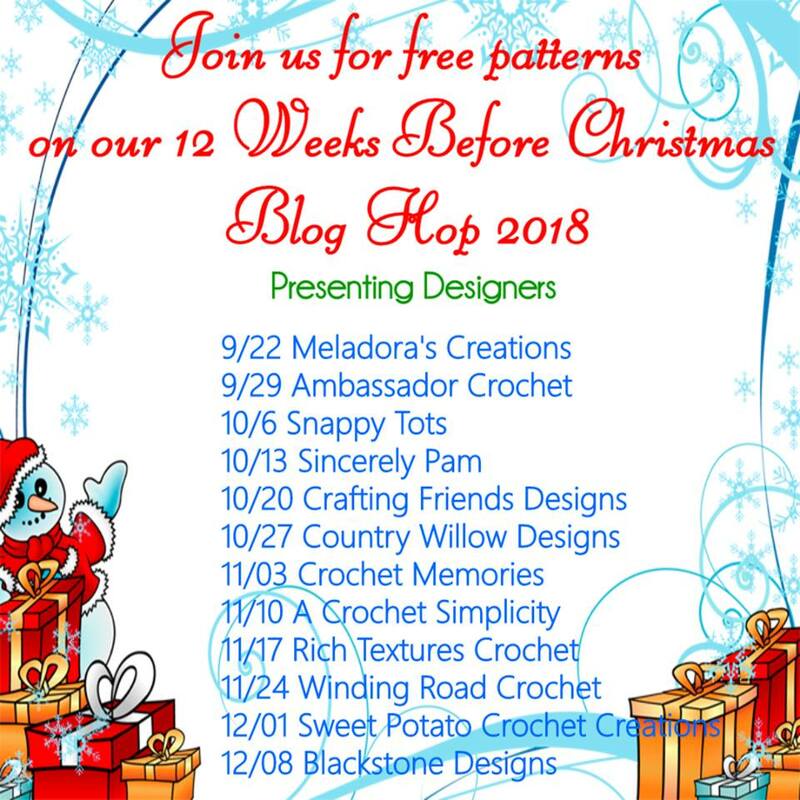 Let’s keep this blog hop going with AMBASSADOR CROCHET! Love this little bag! Such a cute idea for Christmas gifts! My daughter still uses it as her main bag. It’s a keeper! Very cute! My granddaughter will love it.